How to run repeated searches, based on a filter result, jumping quickly between many places, tracking dependencies over many text files, with a Freeware tool for Windows and Linux/Mac. of lines containing that word immediately, in a so-called Filtered View. and you jump straight to the text location of that line. (square striped button at left top) or press F4, or CONTROL+A. shown in a NEARBY view, instead of your current view. very fast, without the need to close and reopen the filtered view. filenames in a filtered view, to see only the pure result lines. -  if the path mask is empty as well, you get a list of all loaded files. -  if the path mask is set, you get a list of all selected files. and Depeche View jumps to the beginning of that file. Press CTRL+SHIFT+INSERT to copy the whole filtered view text to clipboard. 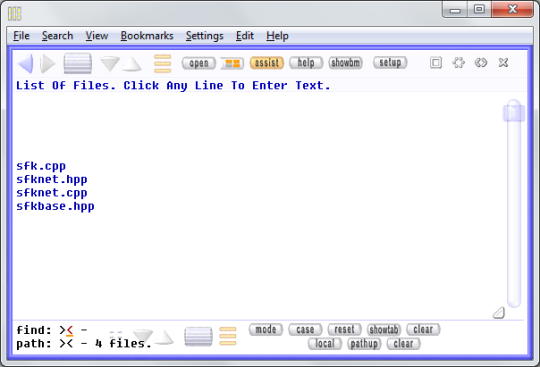 Press CTRL+INSERT to copy only the visible lines to clipboard. it can no longer run a search, can it? Now, how do you search for "testBar" from within a filtered view? -  press SHIFT, and keep it pressed. -> the word is searched instantly. then click on "Foo" and move the mouse over to "candy". 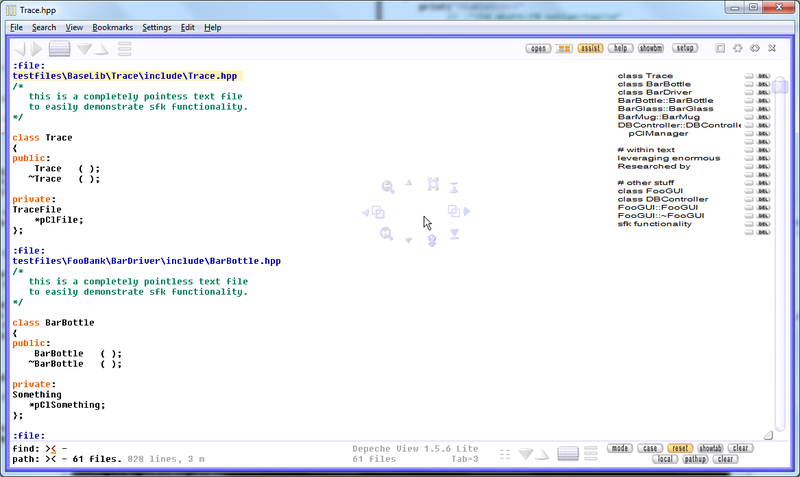 A phrase like "FooController::testBar(char *pszCandy"
-  within the first window, keep SHIFT pressed. -  then RIGHT click onto a word or phrase. and the word or phrase is searched in a NEARBY view. RIGHT-CLICK on the filter button (big square button with lines). Depeche View changes from Auto Filter mode to First Result mode. The filter button now shows three dots. matching text location, without creating a filtered view. To stop First Result Mode, RIGHT-CLICK on the filter button again. a filtered view on or off temporarily, even if in First Result Mode. then leave Setup and press CONTROL+S to save changes permanently.